Iran's parliament has finally approved a new oil minister, ending a three-month political deadlock. The appointee, Kazem Vaziri-Hamaneh, was the acting oil minister and a former deputy oil minister in the previous government. President Mahmoud Ahmadinejad initially said he wanted a fresh face to counter the "mafia" running Iran's oil sector. But his three previous nominations were criticised as not experienced enough and failed to win MPs' support. The BBC's Frances Harrison in Teheran says the protracted row has called into question the president's judgement, and dented investors' confidence. Mr Ahmadinejad's first nominee was rejected by parliament, his second candidate withdrew, fearing defeat, and the third nominee also lost a vote of confidence. 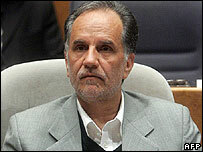 Analysts said Mr Vaziri-Hamaneh's experience in the oil ministry made him a more acceptable appointment for MPs. The Iran is the world's fourth largest producer of crude oil. Oil exports account for 80% of its export revenues and the oil minister is therefore a key post, say analysts. Correspondents say the hardline president's autocratic leadership style has upset some MPs, who complain they have not been consulted in the appointment of key positions.